One year before Americans elect a new president, the positions of the leading candidates for the office from both parties are becoming clearer on topics that advisors care about. What the candidates are saying about issues advisors care about. 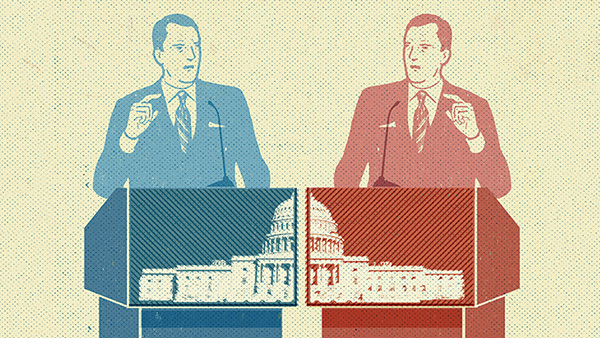 One year before Americans elect a new president, the positions of the leading candidates for the office from both parties are becoming clearer on topics that advisors care about, and that will affect their clients and, perhaps, the economy and markets. Vice President Joe Biden announced at press time that he would not run in the 2016 presidential race. Former Secretary of State Hillary Clinton held steady as the Democratic frontrunner just as Donald Trump maintained a pretty wide lead in the Republican race. It’s still too early to tell who will be the official Democratic and Republican nominees, but with the debates in full gear, candidates were able to air their positions on a myriad of issues that they’d focus on as commander in chief. Clinton’s closest competitors (according to the polls) are Vermont Senator Bernie Sanders and former Maryland Governor Martin O’Malley. Trump’s biggest opponents include retired neurosurgeon Ben Carson and former Hewlett-Packard CEO Carly Fiorina. The former Republican Governor of Florida, Jeb Bush, trails all three, and is vying for the fourth-place spot with Rep. Marco Rubio of Florida. Greg Valliere, who left his post as chief political analyst at Potomac Research Group in early October to become chief global strategist for Horizon Investments, predicted in mid-October — like other political watchers — that Biden would likely wait for Congress to hold its hearings on Bengahzi that week before announcing his decision. But Biden didn’t wait until then to announce that the “window” had closed for him to enter the race. Clinton also said during the first debate that she’d fight to keep the Dodd-Frank Act intact. She has officially endorsed the Department of Labor’s rule to amend the definition of fiduciary under the Employee Retirement Income Security Act. After the repeal of Glass-Steagall in the late 1990s under the Clinton administration, “when we allowed a few big banks to become giant mega banks,” O’Malley continued, “when bets go bad, we’re left with two choices: Either they take us down the tubes into a second Great Depression or we have to bail them out. That’s not capitalism, that’s a rigged game.” O’Malley said he’s for reinstating a “modern version” of Glass-Steagall. Sanders would increase the top estate tax rate to 65%, and lower the estate tax exclusion to $3.5 million. Clinton had yet to weigh in on her specific tax policy. The Republican candidates, meanwhile, have come out heavily in favor of broad tax reform, with Trump stating that he’d provide tax breaks for the wealthy and poor. Under his plan, those earning less than $25,000 ($50,000 for married couples) would pay no income taxes, while the top bracket — those earning $150,001-plus and couples pulling in $300,001 and up — would pay an income tax rate of 25% (a sizable cut from the current top rate of close to 40%). Bush, on the other hand, according to the Tax Foundation, would establish three tax brackets, with rates of 10%, 25% and 28%. The top rate applies to taxable income over $85,750 for single filers and $141,200 for joint filers. His plan calls for an increase in the standard deduction to $11,300 for single filers and $22,600 for joint filers. Rubio would lower the corporate tax rate to 25% and eliminate the estate tax. On economic policy, Trump has said that Federal Reserve Board Chairwoman Janet Yellen is “keeping monetary policy accommodative” as a political favor for President Barack Obama and Clinton. There is some bipartisan consensus on one issue: closing the carried interest tax loophole exploited by hedge funds, which is backed by Trump and Bush as well as Clinton and Sanders. Sen. Tammy Baldwin introduced a bill in June, the Carried Interest Fairness Tax Act, that would generate $15.6 billion over 10 years, according to the Joint Committee on Taxation.